Rubella are transmitted by droplet infection. The incubation period for rubella is 13-21 days. Rubella is highly contagious. 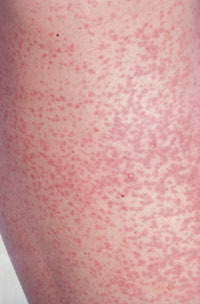 The pathogen is a rubella virus. Everyone can get rubella, only 1x, that's why rubella is a children's disease. 80-90% of children receive the rubella if they have not been vaccinated. Rubella is especially dangerous for pregnant women. It can cause miscarriage or harm the child come. Be treated in the event of illness symptoms. Against rubella can be vaccinated. Especially women who never had the disease should be vaccinated, so the risk of infection during pregnancy does not exist. The pathogen is the world still quite widespread. However, by the very large number of people vaccinated, the number of disorders significantly decreased. Rubella is contagious during the incubation period. Rubella Incubation period: 13-21 days.